Among them a small tree, the Rhododendron, offers the most spectacular flower experience. It is entirely covered with big beautiful, deep red flowers. 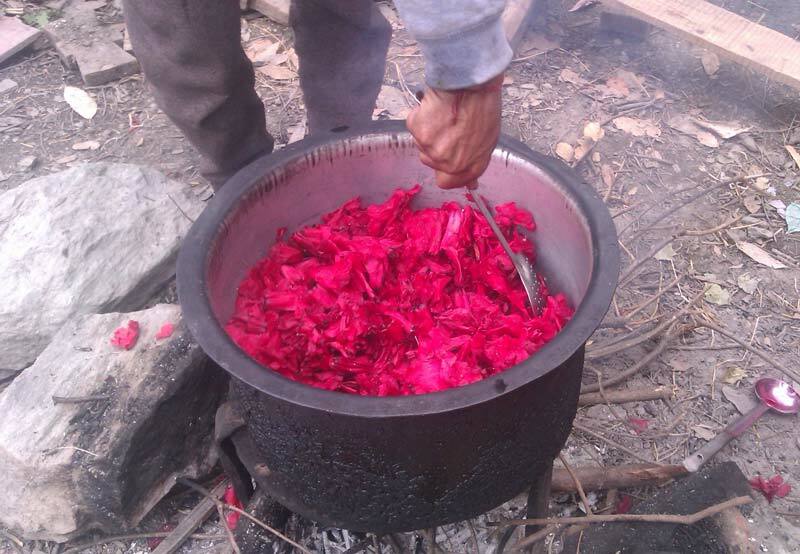 The villagers collect them for making Rhodendron juice. But surprisingly, most of them do not know the making process. They bring the flowers to a manufacturing unit where their flowers are converted into juice. 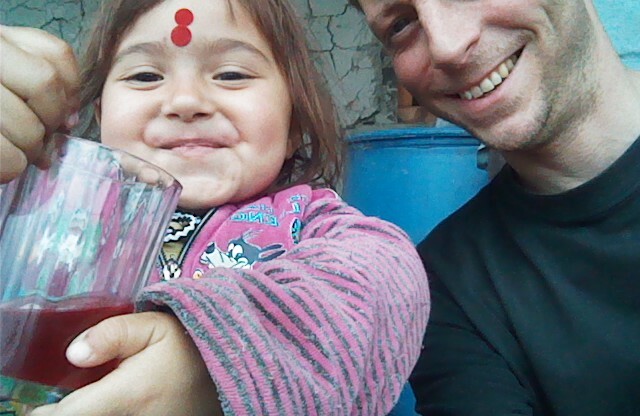 With my village uncle, we decided to try ourselves with the simple home equipment. I didn’t find proper recipe of this delicacy on the web, but with my little experience of fruit juices we dared to venture into flower juice making. 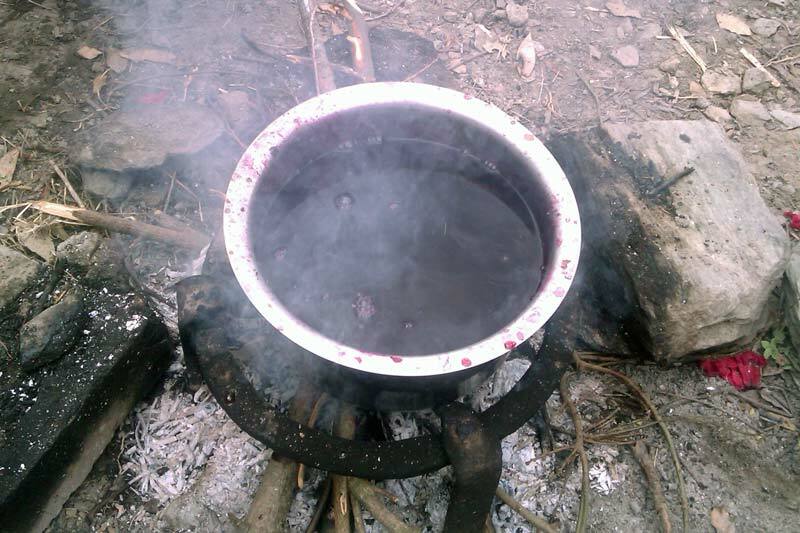 And it came nicely, so I am happy to share what we tried this morning in my village. Be aware that not all Rhododendron are eatable. Some are even very toxic. Here, we are talking about the species that are widely found in upper part of Nepal and western Himalaya. Collect 2 kg of the flowers, remove the internal parts (stigma, pistil). Wash them with fresh water. Put 3 liters of water in a large pan, add the cleaned flowers, bring to a boil and simmer. I added 1 tsp of sodium bicarbonate. 2 kg of flowers is a lot of volume ! Help the flowers to mix with the boiling water. 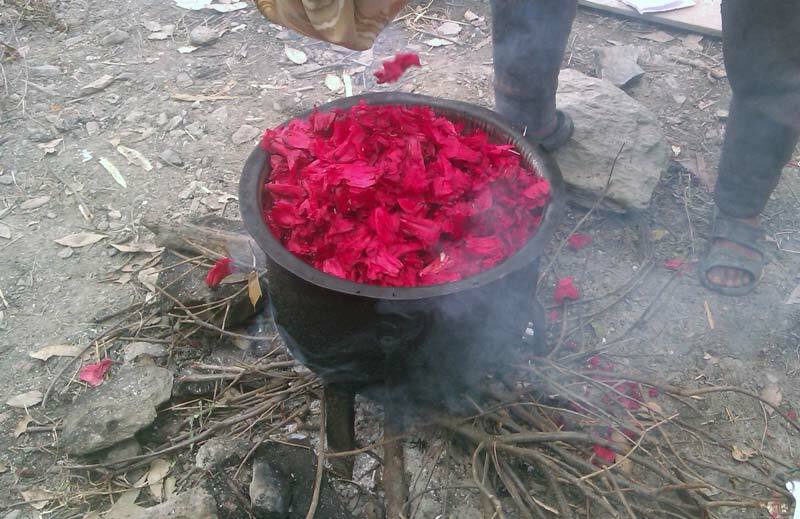 After about 15 minutes, the flowers gave most of their juice, colour and aroma in the water. It was the good time to sieve the “flower soup”. 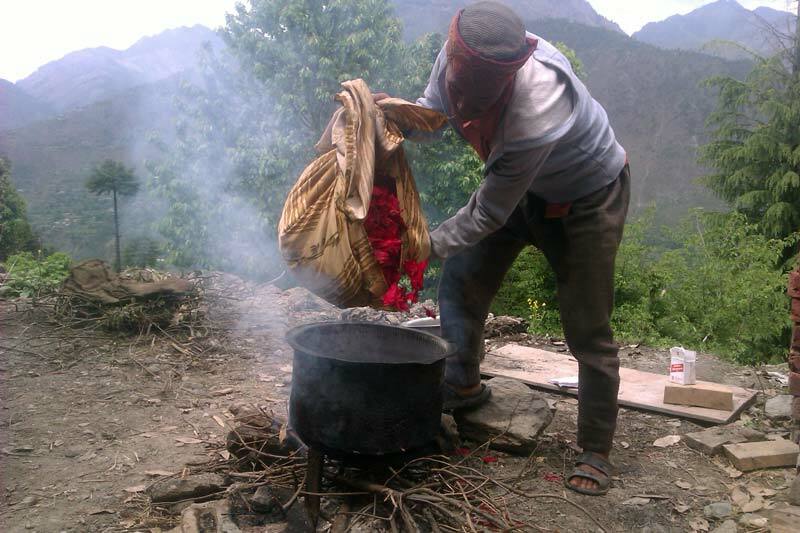 When the flowers have cooled down, you can even extract more of their juice by pressing them in your hands. 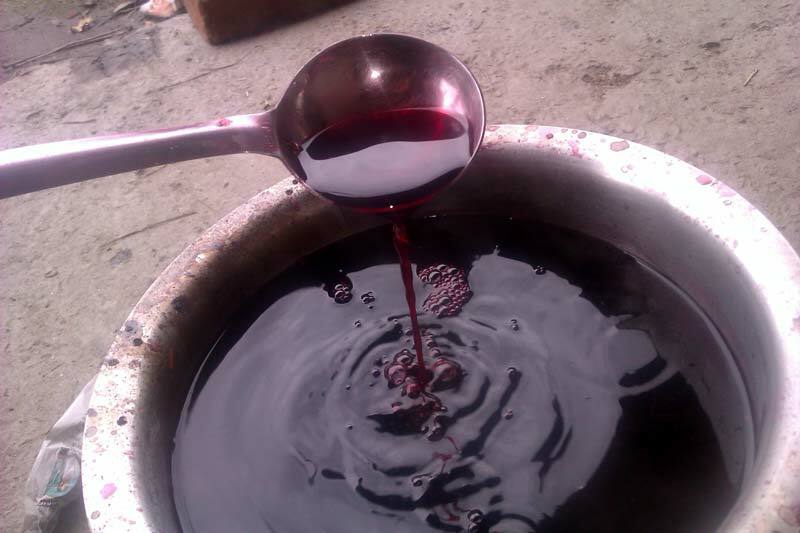 We got about 4 liters of very dark red liquid. We added 2.5 kg of sugar to it and simmer again for 15 minutes. 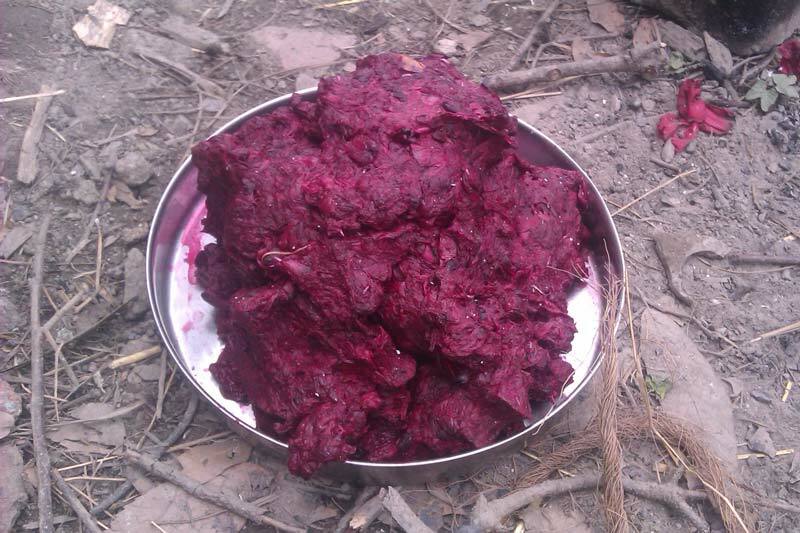 The flowers after extracting the juice. That’s it. To drink it, just mix a dose of the squash with double or triple dose of water. I guess this can be preserved for several months if bottled in proper conditions. Hi. Thanks for your message. Would you be interested in getting some sample?